The study of earth’s history is not a subject of idle curiosity. We need to know more if we hope to solve the environmental crises that face humanity. That’s one reason that a biblical perspective on history is so important. It helps us make sense of the problems we face today and prepare for the future. But global warming is far more intricate than one 48-minute film can convey, and most people are simply not getting some of the most important information. It’s clear that global warming is a complex and emotionally charged issue, one that cannot be ignored in today’s cultural and political climate. New claims and counter-claims appear in the press with numbing regularity, leaving many Christians uncertain what to believe. Rather than getting lost in the details, it is necessary first to uncover the basic facts and then to understand the assumptions that drive the interpretations of those facts. Although many people may think otherwise, all of us have assumptions (beliefs) that influence how we look at the facts. If a scientist believes in billions of years of earth history, he will assume, for example, that polar ice needed hundreds of thousands of years to build up over two miles in depth. Scientists who believe in the biblical account of Noah’s Flood, on the other hand, believe the ice must have appeared shortly after the Flood. Depending on their assumptions, equally skilled scientists can reach very different conclusions. In the global warming debate, it is important to separate fact from interpretation. We hear a great deal about the dangers of CO2 emissions and greenhouse gases, but rarely do we hear the facts behind the hype. Assumptions and beliefs about the past play a major role in shaping our present attitudes. In order to see past the hype, we must start from God’s Word, the Bible. 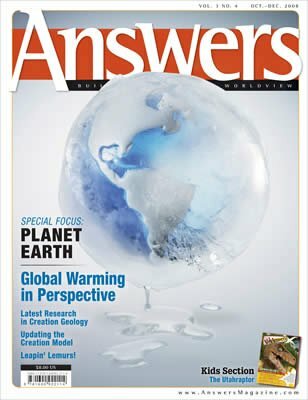 From there we can uncover the truth about climate change—the history, the causes, and the answers. Don’t just wonder. Get Answers. How Much Global Warming Is Natural?